Each year, we wait impatiently for them, and now, here they are again, at last! Since they are only picked once fully ripened, and the journey between the field and our plates is quite short, the taste and nutritional value of locally grown strawberries are beyond compare. Strawberries are an excellent source of vitamin C, a good source of potassium and they also contain folic acid, pantothenic acid and magnesium. They are known for their fortifying, depurative and diuretic qualities. The Romans used to add strawberries to their beauty masks. 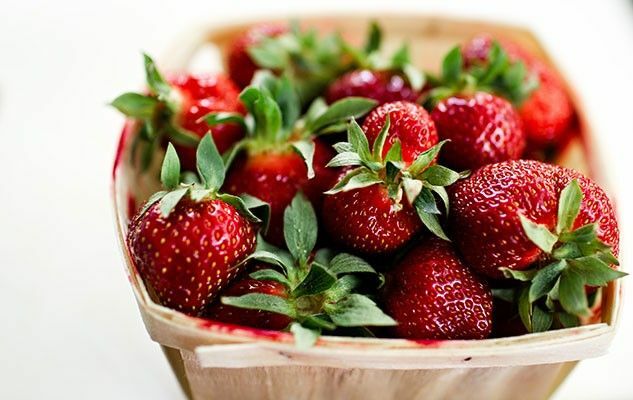 Strawberries release an odor known as ‘fragrance’; this explains the origin of its French word, “fraise”, which is derived from the Latin “fragra”. Technically, the strawberry is not a fruit: what we eat is in fact the stalk that has swollen, after fertilization of the flower. The real fruits are actually the tiny yellow seeds scattered all over the surface of the strawberry! Whether you buy them from your local fruit and vegetable market or you pick them yourself in the field, you should definitely make the most of them!